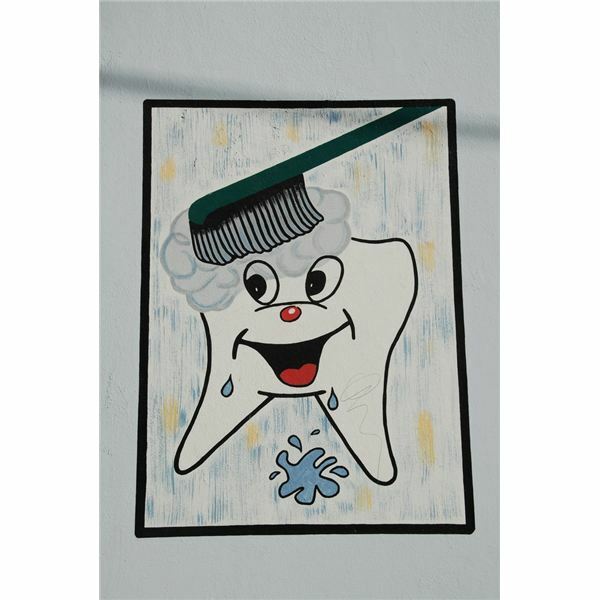 By the time a child reaches school age, he is pretty familiar with the tools of dental care; the toothbrush and floss. Here are a few ideas that use these tools. Provide old toothbrushes to do some painting with this tool. Dip the brush into poster paint and do a "wiggle-jiggle" motion on a sheet of paper. Take the toothbrush up and down, back and forth, and circular strokes as you paint. When finished cut the paper into a tooth shape. This art project teaches the concepts of proper brushing. Another project is to have the children dip a length of dental floss into paint and then lay it on a sheet of paper (leave the floss ends sticking out). Do this same procedure with several pieces of floss using different colors of paint. Fold the paper in half and pull out the floss. When you open the paper, a unique and colorful design will appear. Sing a little song as you work. Tune: "Row, Row, Row Your Boat." Second verse: Floss, floss, floss your teeth…Keeps the plaque away. Try this science project that’s fun and informative. Pretend that the surface of a hard-boiled egg is your tooth. Notice how the egg color is close to the color of tooth enamel. Discuss together how certain foods and drinks can stain the teeth. Soak eggs in a few drinks overnight such as grape soda, red fruit punch and even cola. The next day, remove the eggs and examine for staining. Gently brush the egg with a toothbrush and toothpaste. Work on getting the eggs back to a “happy tooth" color. Continue your discussion and ask the chldren how the tooth got white again and why brushing teeth is so important. Children can learn about teeth in the classroom. One such project uses play dough and white navy beans. Make a batch of homemade baker’s clay (recipe below) and tint it pink with a drop or two of red food coloring. Have the children form a “U" shape with the dough. This represents the gum line. Show them how to press white navy beans into the dough to represent the teeth. Use caution and supervise children when working with small objects such as beans, as they can become choking hazards. Mix the flour, salt, and water. Knead until smooth, adding extra water if the mixture is too stiff. Shape the clay and position the beans. Place these figures on a piece of foil and then on a cookie sheet. Bake at 300 degrees F. for about one hour. This recipe makes several dentures (enough for several children). One of the little celebrations of life is when a child loses a tooth and awaits the tooth fairy. To make a special place for this tooth, provide children with a white envelope and invite them to decorate this with crayons and markers. Copy this poem and glue it to the center of the envelope. Send this craft home and when the child loses the next tooth, she can place the tooth inside and tuck the envelope under her pillow at night. My mouth no longer needs it. I really want to keep it. But I know it belongs to you. There is nothing better than pretty white teeth and a healthy smile. Use this dramatic play dentist theme as part of your health series this year.